Sorry, probably my English is far from perfect, but you understood wrong. Please read the example above once again and pay attention that every removal job cleans all unprotected cookies, not only cookies from the tab where it was initiated by. I ran a test. 10 news sites that sets cookies. Not in whitelist, not old cookies present, no tabs open. Delay set to 300 seconds. I have added my interpretation of how I think the delay system works in (parenthesis). If I now understood it correctly, EVERY time you "close a tab" or "go to a new domain within existing tab", a NEW timer is set, a timer that triggers the clean-up after x seconds set by the delay setting. Every clean-up that triggers, cleans all existing cookies/localStorage that is not in whitelist, nor in open tab. Right? If I'm correct, then I've to say that I don't understand this behavior from the end-user point of view. For example, if the user opens and closes lots of sites in a short amount of time, there's lots of your addon timers in the same time running and waiting to trigger after the delay. I could understand this delay system if only one timer would run and trigger every x seconds set by the delay setting. And if the user monitors how the addon works in the first days, keeping the log pop-up setting on, then the varying opening/closing of sites creates log messages that will confuse the user, like me, and I'm a developer too, good at testing and understanding the logic of software/services. Mind you, the smaller the delay is set, the less confusion it creates. IMO this behavior is going to lose some of your addon users, probably to the SDC addon which isn't so strict and doesn't break cross-site transactions. But it wouldn't have to be like that. By changing your delay system (clean-up delay is per tab/site closed), you could offer users a choice between a very strict policy (e.g. delay set to 10 sec) or a bit lenient policy (e.g. delay set to 2 or 3 minutes) that would enable cross-site transactions. What would this change to the delay system hurt? I don't see any performance problems since you already with current system start a lot of timers. On the plus side: more control to end-users, and it would make the delay system/setting much more understandable to the end-user. Think about it. Anyways, thanks for the answers. If you are not going to change the delay system, unfortunately I'll have to choose another addon, that's a shame because I liked the way you store the whitelist. I'm using Cookies Exterminator 2.7.7 on Firefox 50.0 and today toolbar button suddenly disapeared. 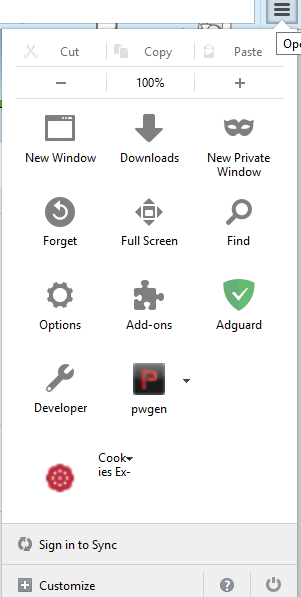 the addon is still enabled and I can open "settings" from addon manager but icon is missing and I can't find way to show it. if you need more details I'l provide. when I disable the addon Status-4-Evar the icon is appear in the "customize screen". and then if I move this icon to status bar provided by Status-4-Evar addon the icon is still visible for at least 1-2 weeks then will disapear again. this is second time this hapens to me. I use the similar code for toolbar button in several extensions and never hit the such problem. I could try to solve it out, but I need to find a way to reproduce it. thanks, I'l try beta version and will inform you if the problem is persist. Your changelog for the 2.7.8b2 version ([±] Keep cookies/localStorage until full delay time is expired) looked promising, so I installed it and did another test. Delay set to 180 seconds this time. Looks fantastic. Every tab/site cleaning was delayed the set 180 seconds. Then I tried another test. Delay set to 10 seconds this time. I don't understand. Now it closed some of the cookies/localStorage after 5 seconds instead of the set 10 seconds. And cleaned, on some occasions, more than 1 cookie/localStorage per clean-up triggered. Was your beta supposed not to do this "combined" cleaning anymore? The changelog text hinted at this. UPD: Now it sounds as "[±] More accurate way to follow the delay before cleaning"
That explains it. I was wondering whether you have such exception. Thanks. Excellent work! Now I can use your addon after all! Wonderful. After you release a stable, you might want to change your addon description page. You could write something like this (I'm not that good at documenting (who programmer is?) but here's an idea): "The default delay for cleaning is 10 seconds. Every closed tab/site that has set cookies/localStorage items, and that is not whitelisted will be cleaned up individually after the delay. Exception is that any cleanup jobs within 3 seconds are combined. You can extend the delay for example cross-site transactions to work properly. In example, shopping in online shop could need you to go to another site temporarily to activate a payment, e.g. to Paypal, and then back to the online store. If the clean up delay is set very low, you will lose cookies/localStorage for the online shop while paying in other website. This can be avoided by raising the delay, for example to 120 seconds (2 minutes), so that you have more time to activate the payment on the other site and then return to the shop site." Cookies Exterminator does not protect from flash cookies (LSO), to avoid them you should not use flash plugin or install BetterPrivacy addon. Cookies Exterminator does not handle any data from private windows and tabs, because the browser does not provide any means to do so. Cookies Exterminator can't remove cookies when privacy option in browser is set to custom settings for history and custom policy for cookies is enabled. Cookies Exterminator is incompatible with the addons who are trying to persist some cookies, such as Beef Taco or TrackerBlock. I have a new request. Sorry. I found out why my "webappsstore.sqlite" file was so big (~83MB). Firefox never does maintenance on that file (and it seems that not either on "places.sqlite" file EDIT: I found from about:config a "storage.vacuum.last.places.sqlite" setting, so FF seems to do some cleaning to places.sqlite file after all) and the database gets new entries and some get removed but not compacted. A "re-indexing" and "vacuum" would be needed to do on those files occasionally to make them smaller and faster. I downloaded a "DB Browser for SQLite" application and set the "auto vacuum" to "full" for webappsstore.sqlite and saved. This made the database shrink to a few hundred KB's!! Now, the "auto vacuum" setting instantly reset back to original "none". I read that it can't be changed after the database has been created, only when creating a new database, so it's not a good solution, it worked now but it doesn't happen automatically. After browsing only about 1 day, the file size is already grown to ~6MB. That's not good. I tried to search for an addon which would vacuum (and possibly re-index) all Firefox .sqlite files but came up short. There were some at least that claimed to do vacuuming to places.sqlite file, but none on webappsstore.sqlite file, and almost all of them were very old/abandoned. Since you're already removing some localStorage items from the webappsstore.sqlite file (does it happen automatically when you instruct to clean cookies? ), could you perhaps consider once in a while, maybe once a week/month, automatically vacuum and re-index the database? Or is it too much out of the intended features of your addon? That would be another plus for your addon against other similar addons. EDIT: or maybe here is an idea to create a completely new addon that would handle all Firefox .sqlite file vacuuming & re-indexing? Anyways, thank you so much for changing the delay system! I set it to 120 seconds and will keep on testing for some time. Modifying the internal *.sqlite files directly from within browser is very bad idea and may cause data inconsistency or even loss. And since Firefox provide no API to vacuum or reindex, such task can't be safely performed via extension. Prekkis, could you please hide your suggestions to the description update under cut or don't use red color in post? JustOff wrote: Modifying the internal *.sqlite files directly from within browser is very bad idea and may cause data inconsistency or even loss. And since Firefox provide no API to vacuum or reindex, such task can't be safely performed via extension. JustOff wrote: Prekkis, could you please hide your suggestions to the description update under cut or don't use red color in post? I'm sorry for the late reply, I just saw this when I got an email notification of a new post by streewolf & I came to read it. I guess you edited that in your post, I don't remember seeing it when I read your post. Anyways, I'm sorry but I don't quite understand what you mean, care to elaborate what you would like me to do? "Under cut"? Thanks for the tip. Though I believe that that program should be ran only when FF is closed. Not really what I was after. Anyways, I'll keep it in mind if I don't find any other solution. Thanks. The Icon gets completely trashed when inside the hamburger sub-menu. The text appears on the side, and it doesn't turn green when browsing a whitelisted site. Is there any way to fix this cosmetic issue? Wurtril wrote: The Icon gets completely trashed when inside the hamburger sub-menu. The text appears on the side, and it doesn't turn green when browsing a whitelisted site. Is there any way to fix this cosmetic issue? The only small issue now is; my homepage is whitelisted and the icon stays red when I first launch the browser. However, the color changes if I browse another site and go back to the whitelisted/greylisted homepage. Wurtril wrote: The only small issue now is; my homepage is whitelisted and the icon stays red when I first launch the browser.